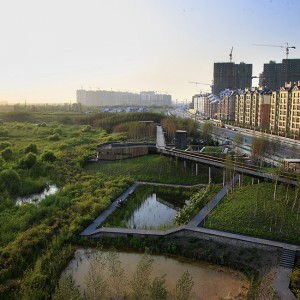 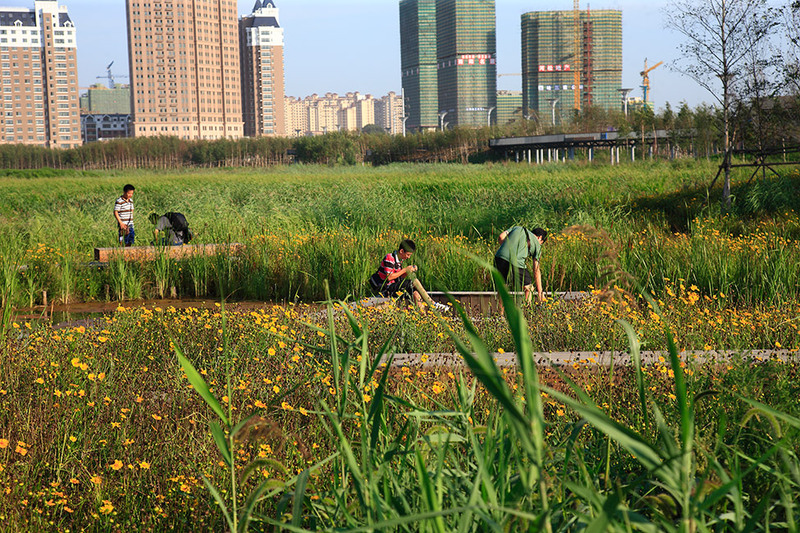 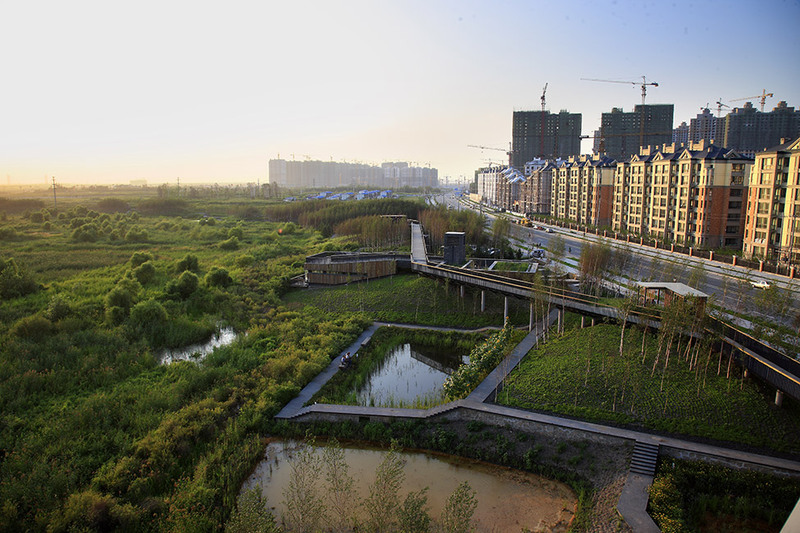 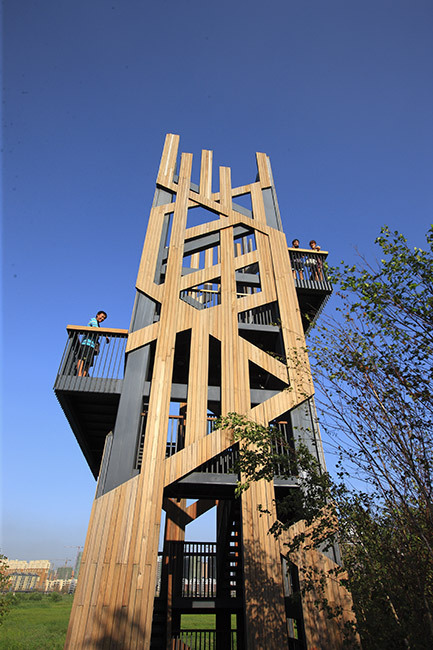 Turenscape: Beginning in 2006, a new urban district, Qunli New Town, in the size of 2733 Hectares, was planned to be developed at the east outskirt of Haerbin City of North China. 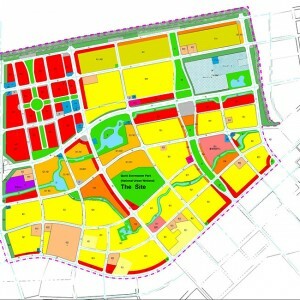 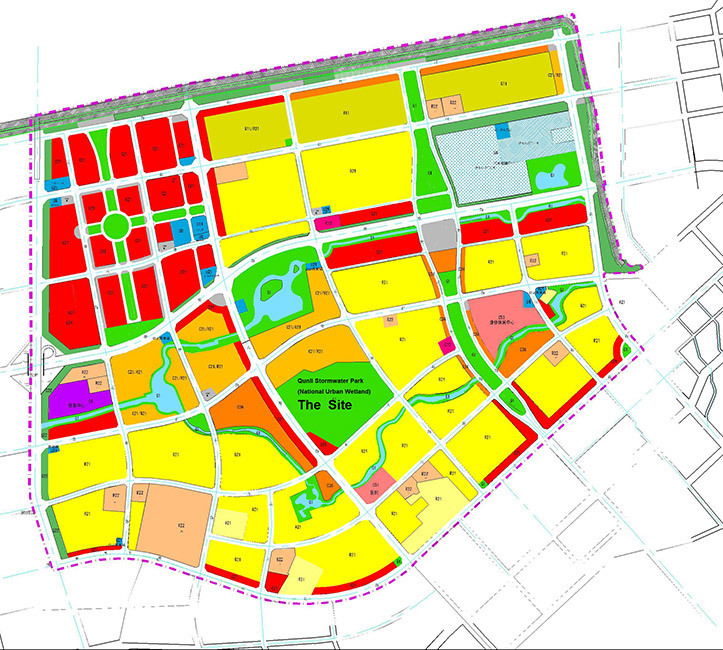 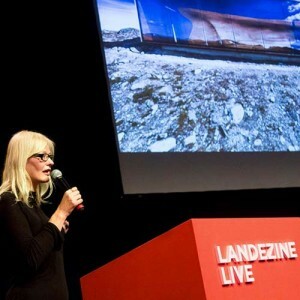 32 million square meters of buildings will be constructed in 13-15 years. 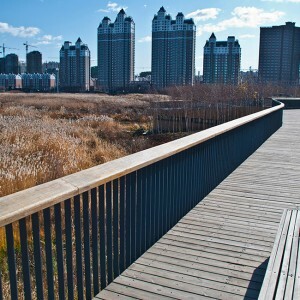 More than one third of a million population are expected to live here. 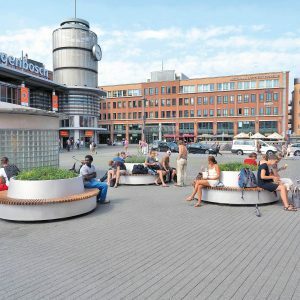 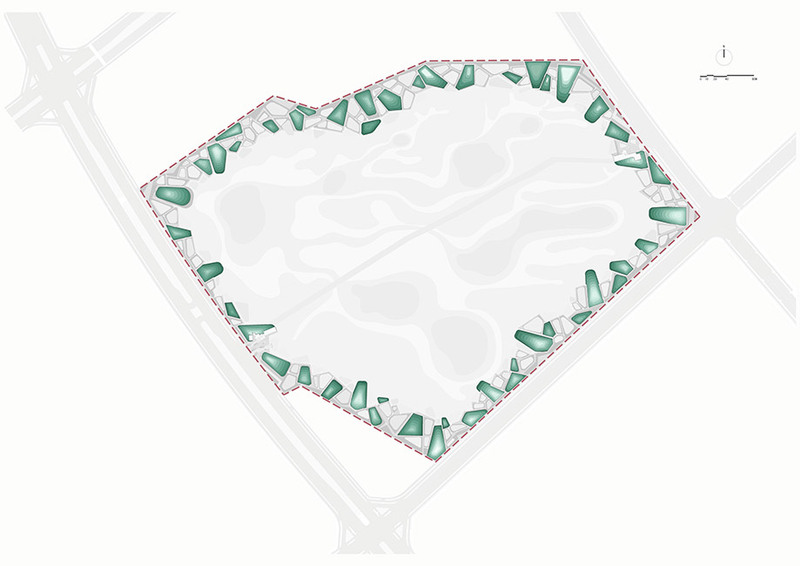 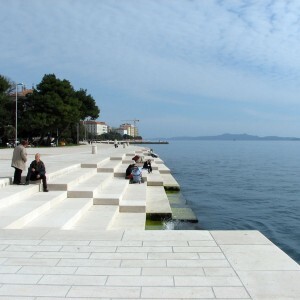 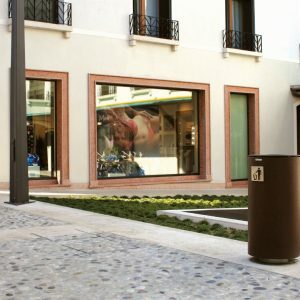 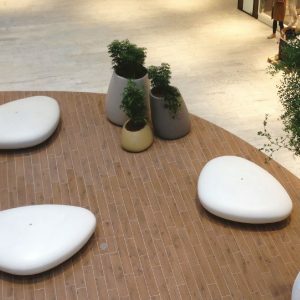 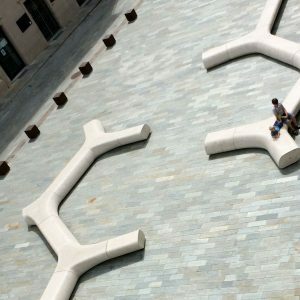 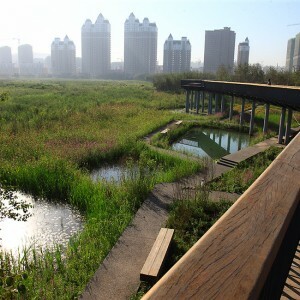 While only about 16.4% of the developable land was zoned as permeable green space, the majority of the former flat plain will be covered with impermeable concrete. 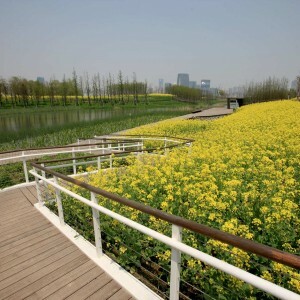 While the annual rainfall of this area is 567mm and concentrated in June through August (account for 60-70% of annual precipitation). 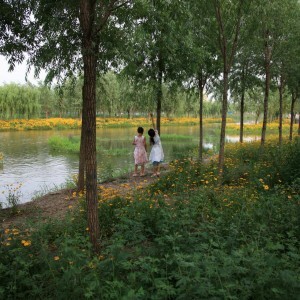 Flood and water log were frequent in history for this area. 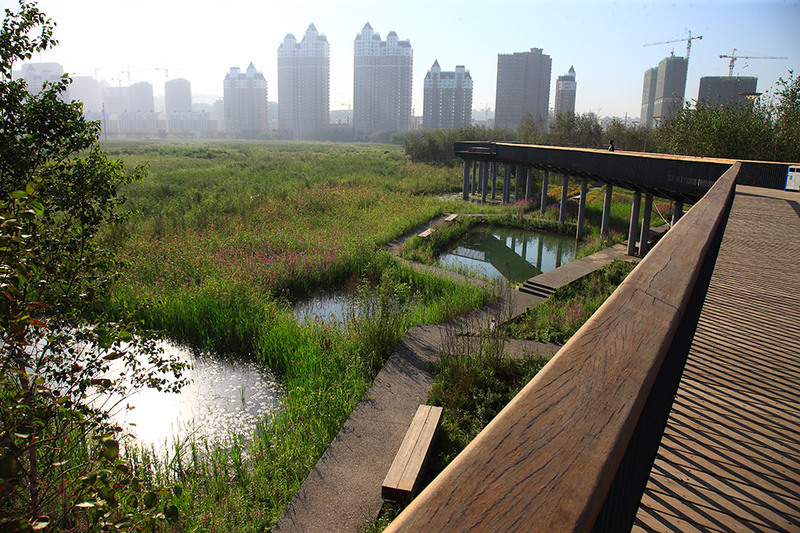 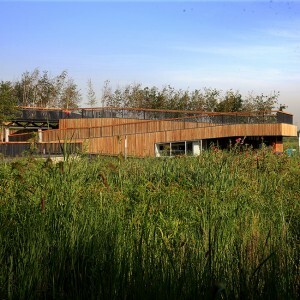 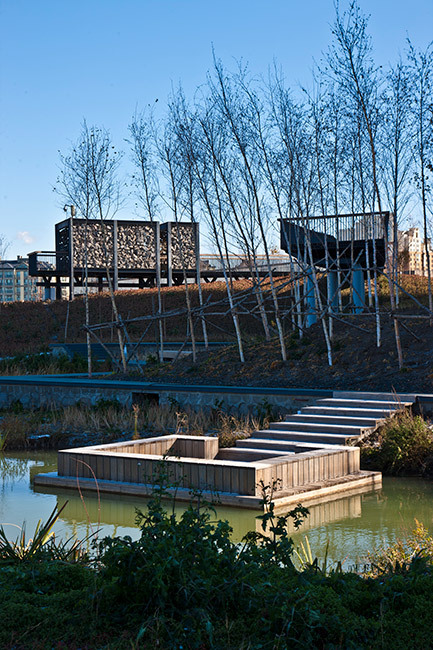 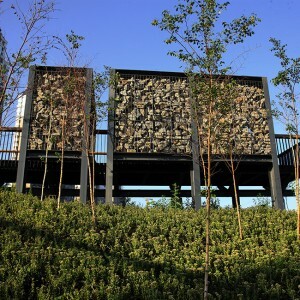 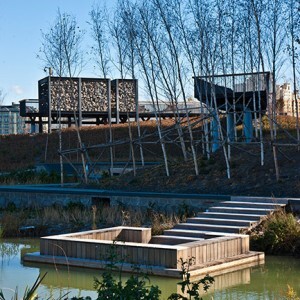 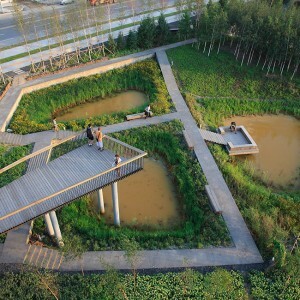 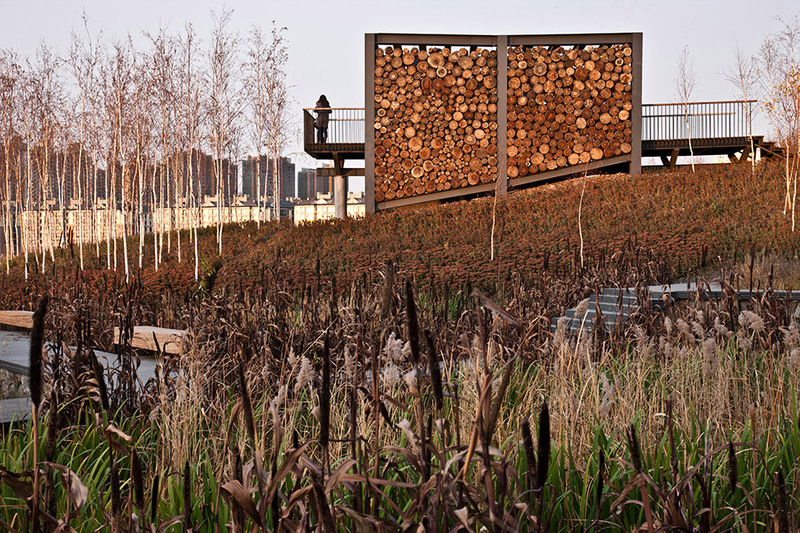 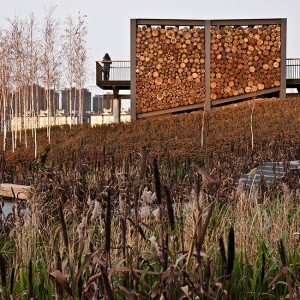 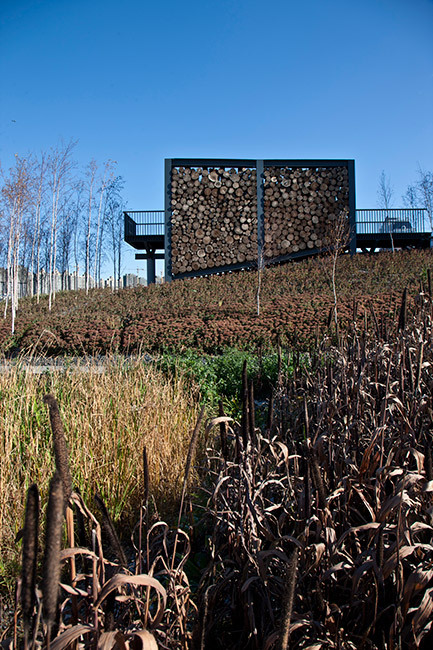 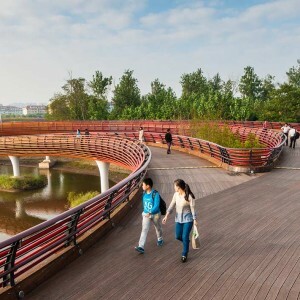 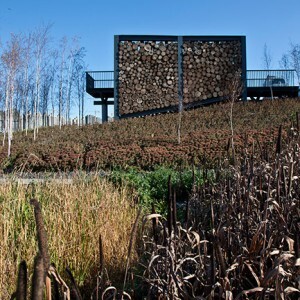 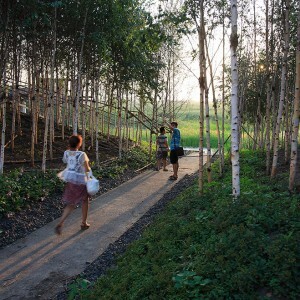 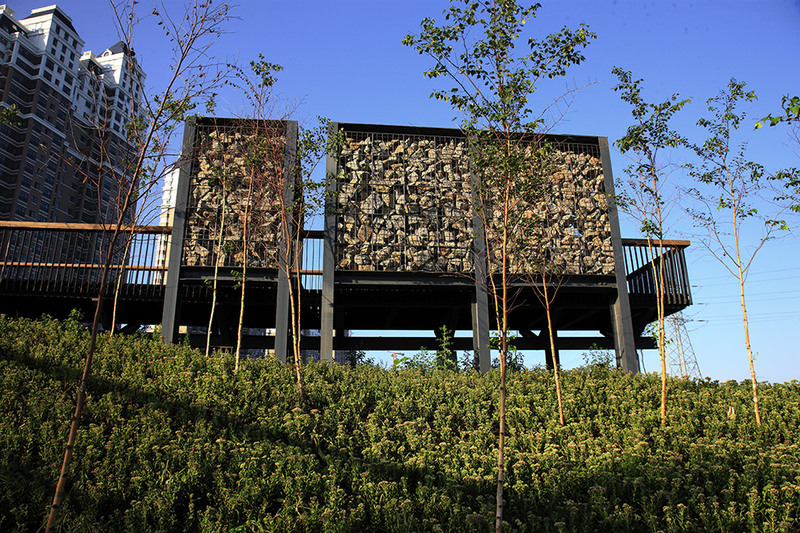 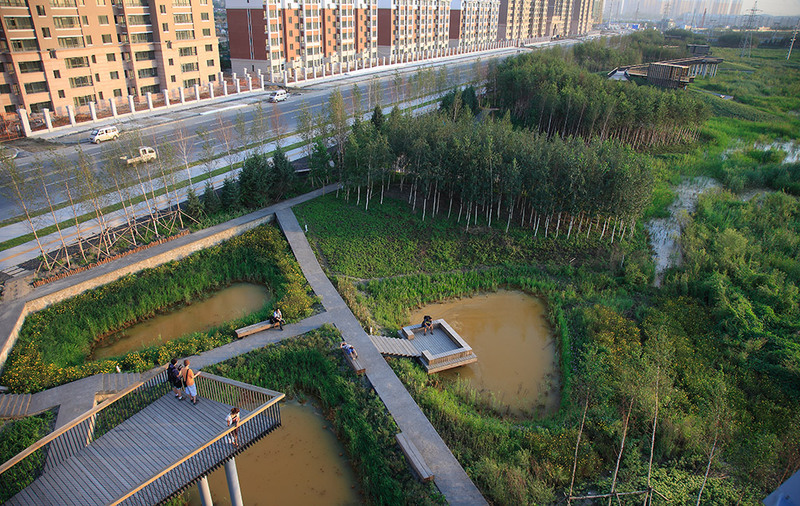 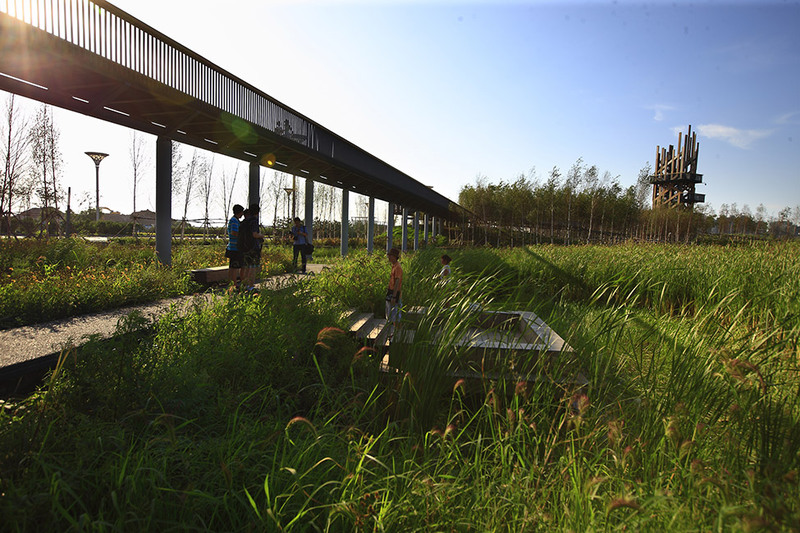 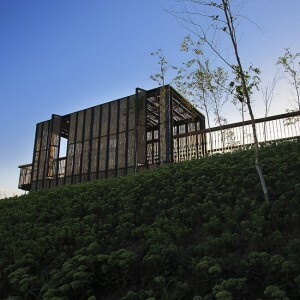 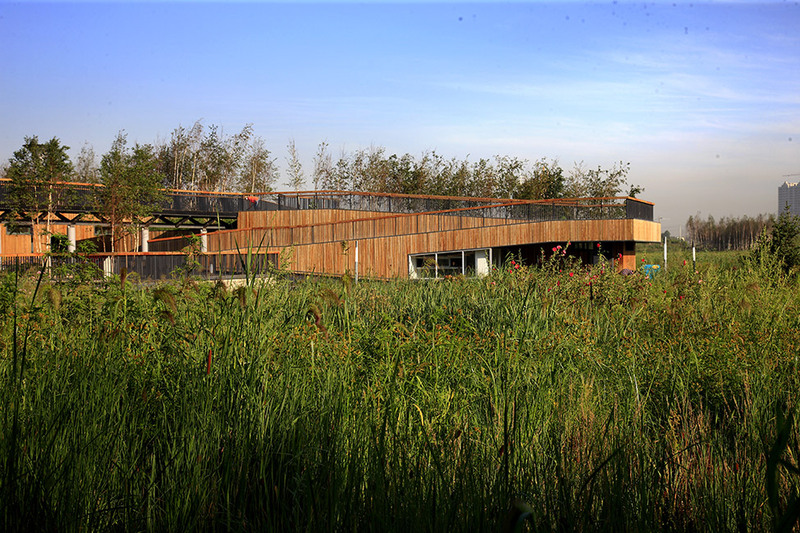 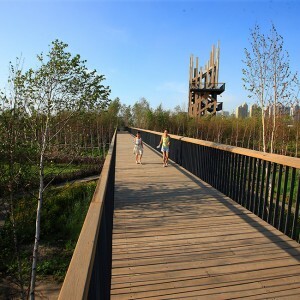 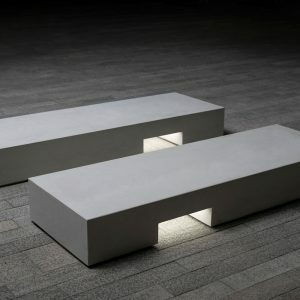 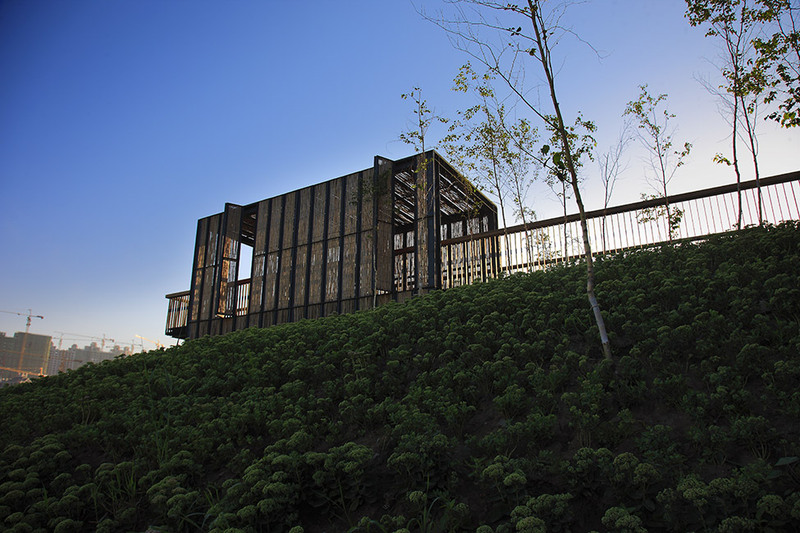 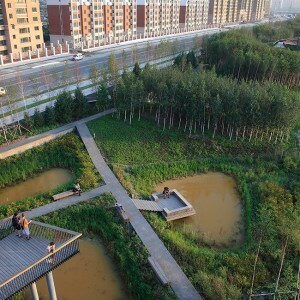 Turenscape was commissioned to design a park of 34.2 Hectares, a former wetland but been surrounded at four side by roads and dense development. 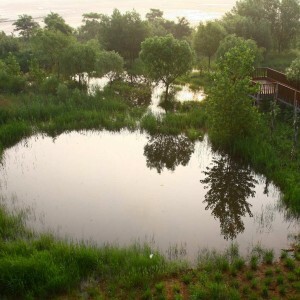 Water sources for this former wetland has been cut, and the wetland is under the threat of disappear. 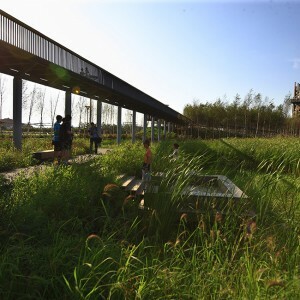 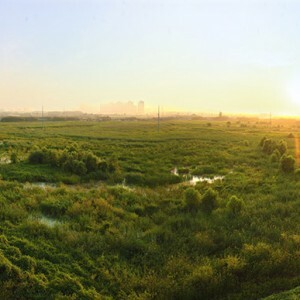 Turenscape’s strategy is to transform the dying wetland into an urban stormwater park, which will provide multiple ecosystems services for the new community. 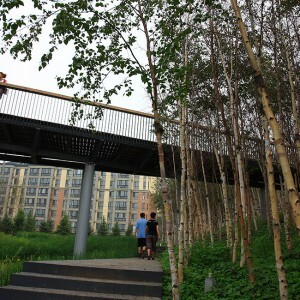 The result is a great success. 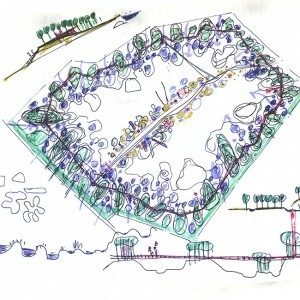 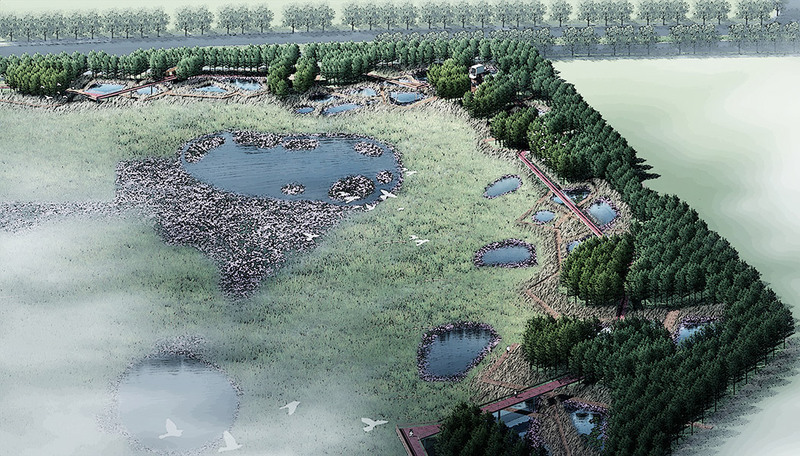 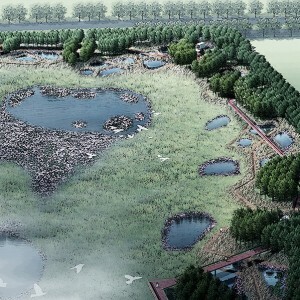 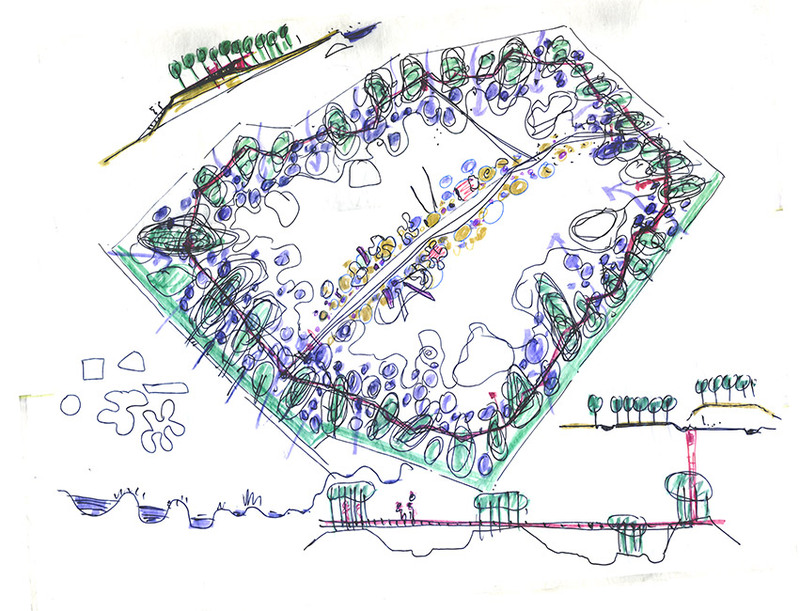 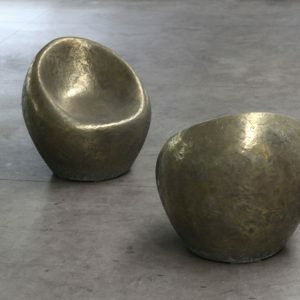 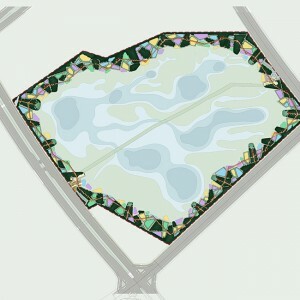 The design solutions include the use of simple cut-and-fill technique to create a necklace of ponds-and-mounds surrounding the former wetland. 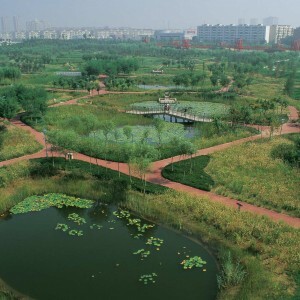 While leaving a major core of the wetland untouched and left alone for natural evolution and transforming, the pond-and-mound ring surrounding the periphery of the wetland creates a stormwater filtrating and cleansing buffer zone for the core wetland, and a welcoming landscape filter between nature and city. 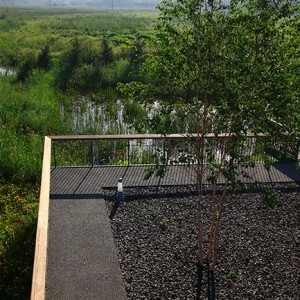 Stormwater from the newly built urban area is collected into a pipe around the circumference of the wetland, and then even is distributed into the wetland after being filtrated and deposited through the ponds. 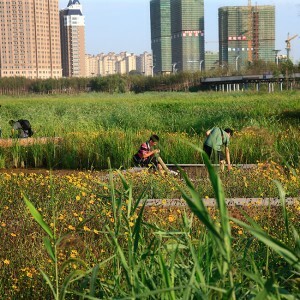 Native wetland grasses and meadow are grown in the ponds of various depths and the natural evolution process is initiated. 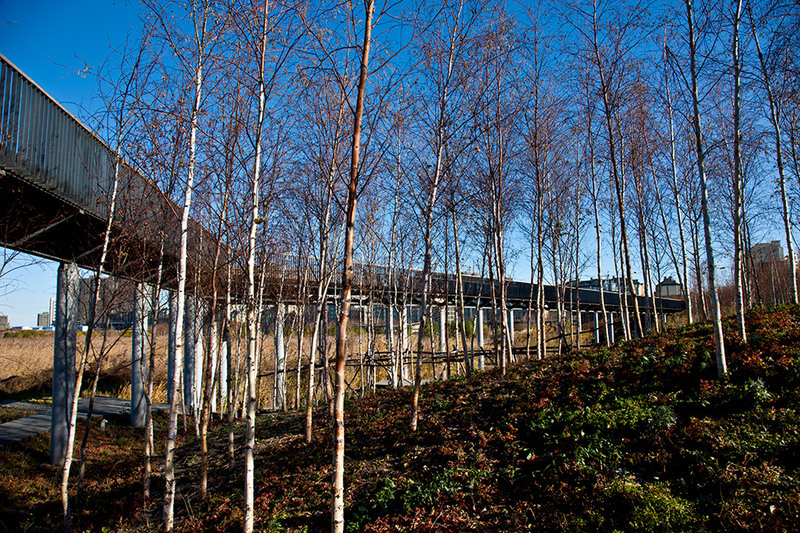 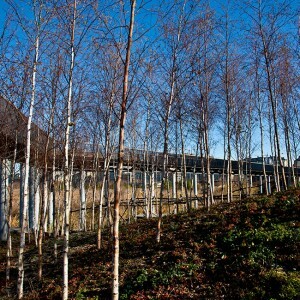 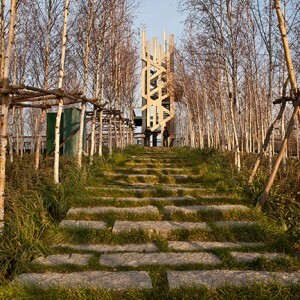 Groves of native silver birch trees (Betula) are grown on the mounds of various heights that create a dense forest setting. 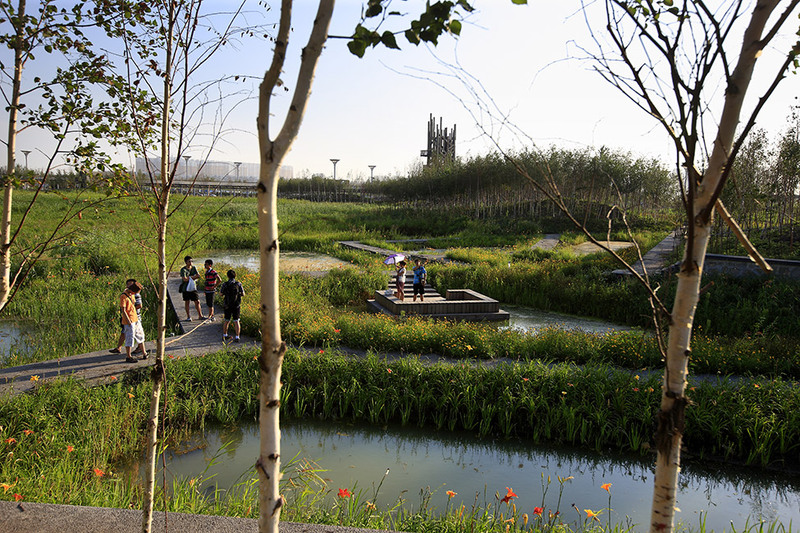 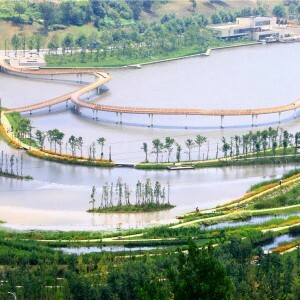 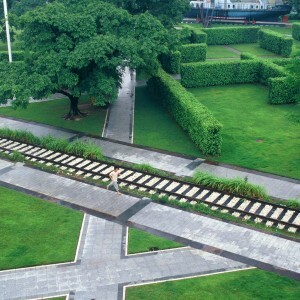 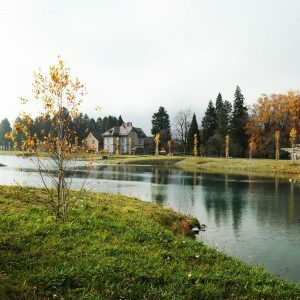 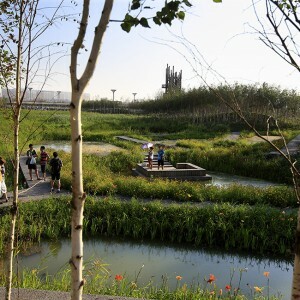 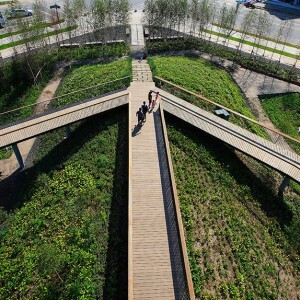 A network of paths are built into the pond-and-mound ring allowing visitor to have a walking-through-forest experience. 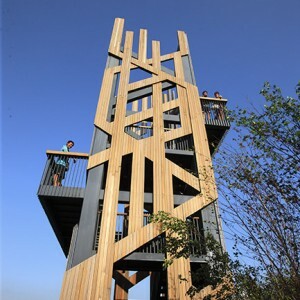 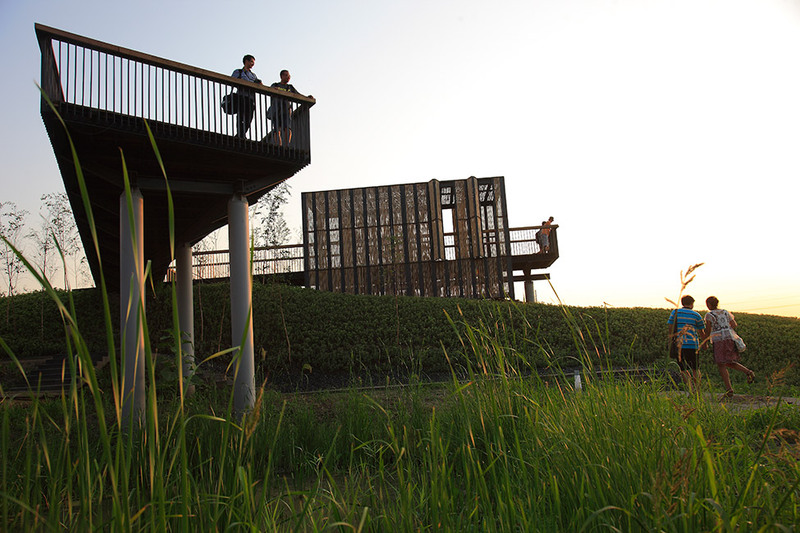 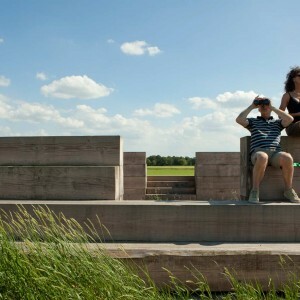 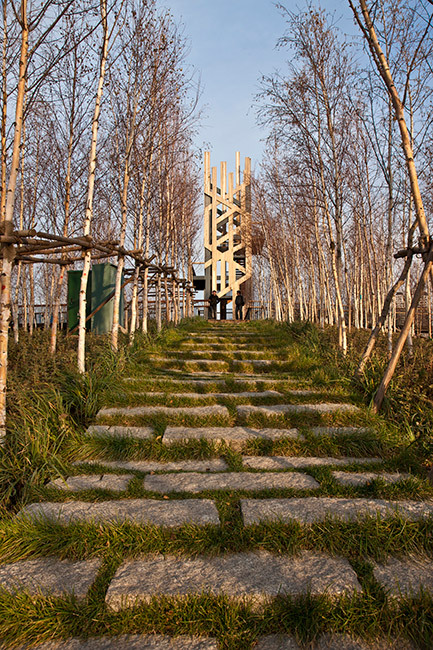 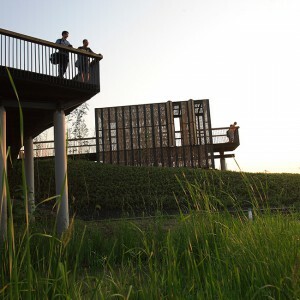 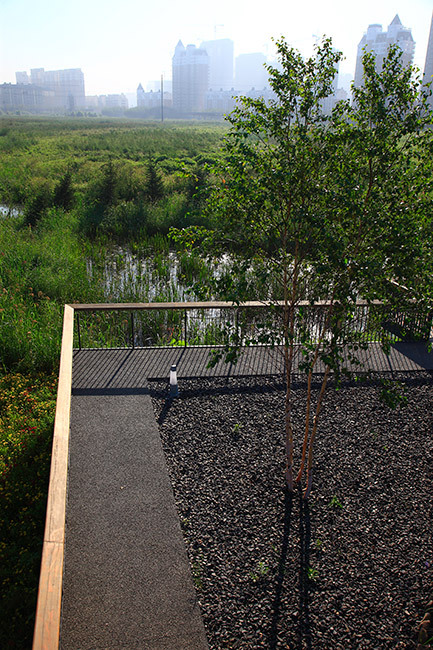 Platforms and viewing towers are set in the ponds and on the mounds to allow visitors have a immediate touch of the nature and have distant views. 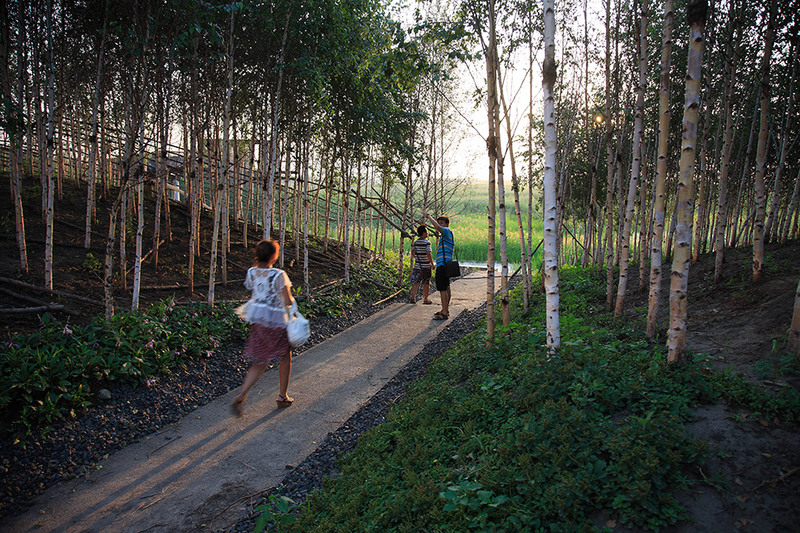 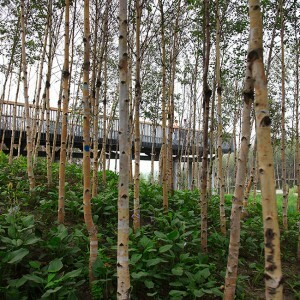 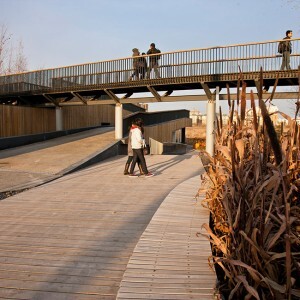 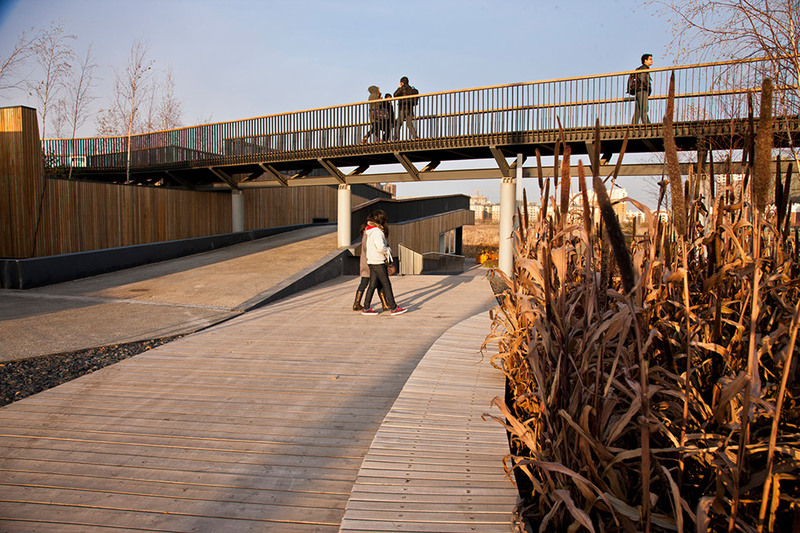 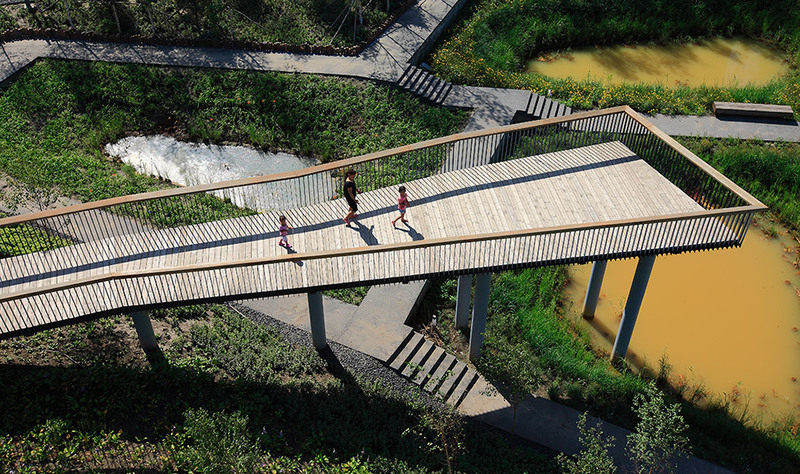 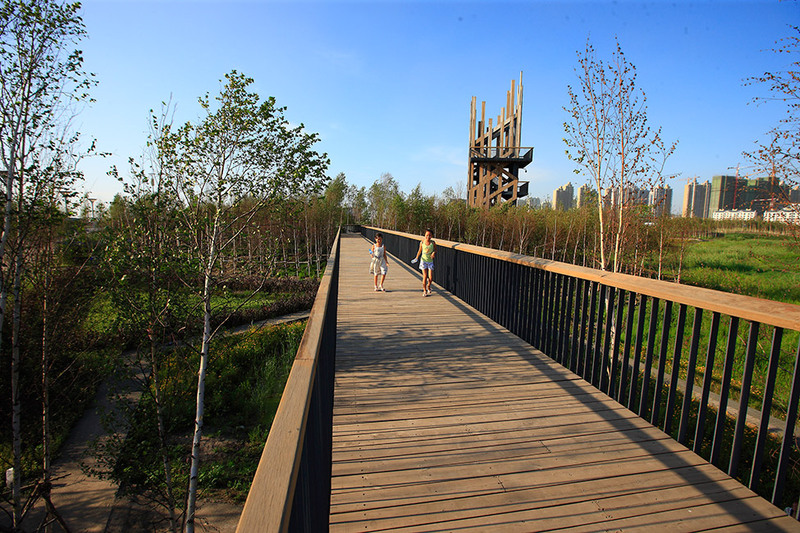 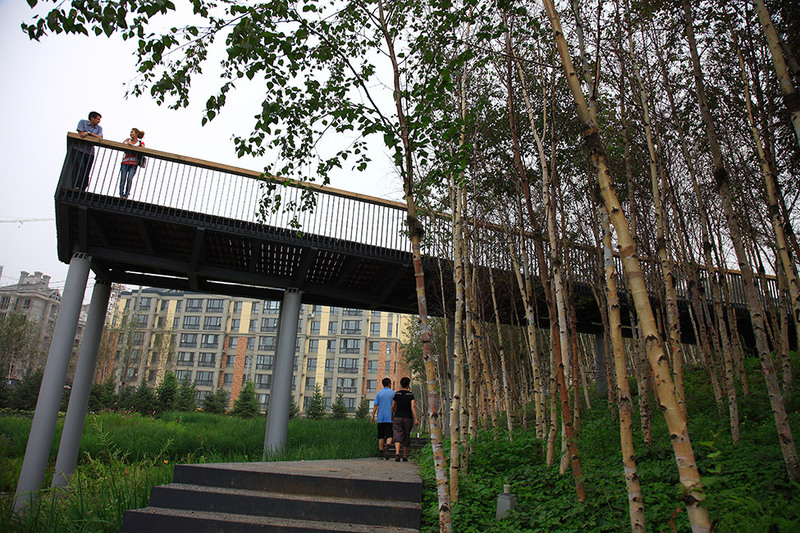 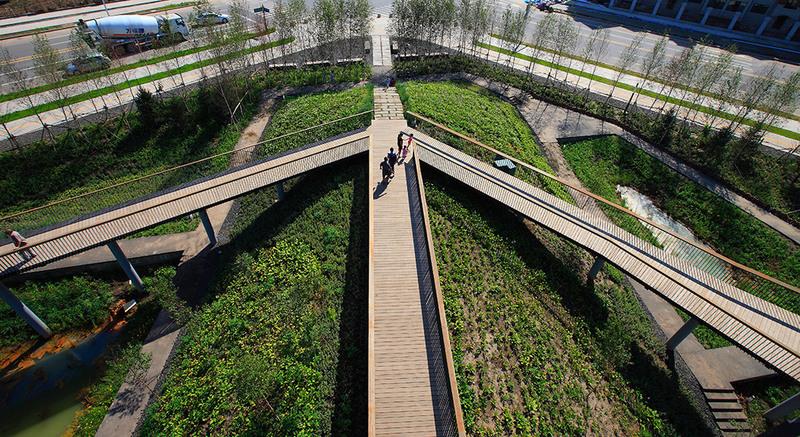 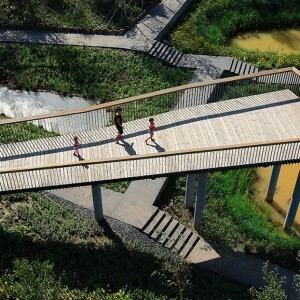 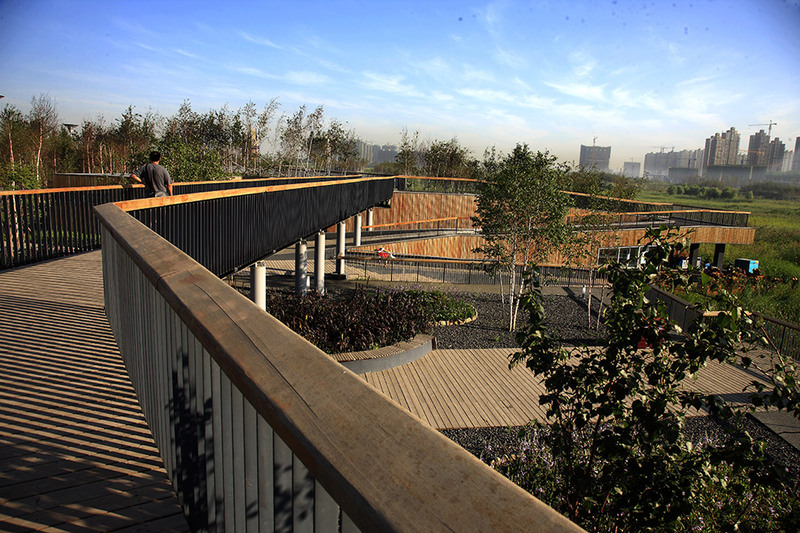 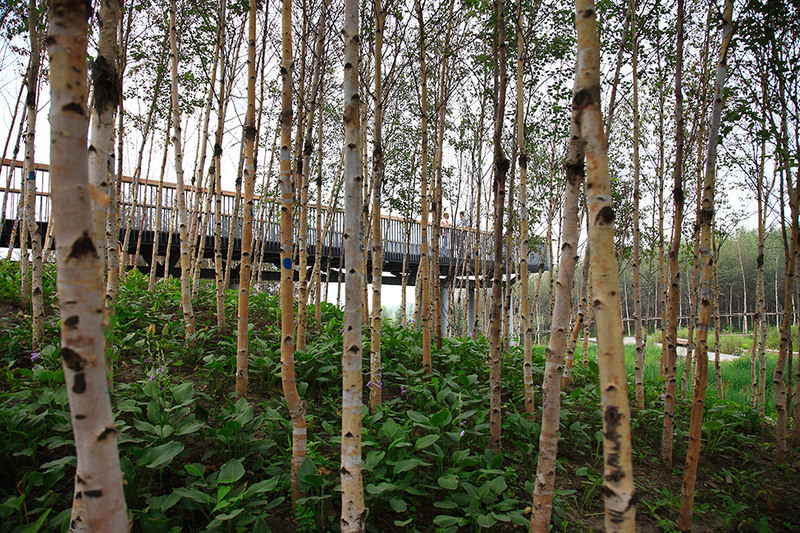 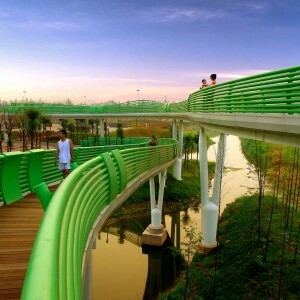 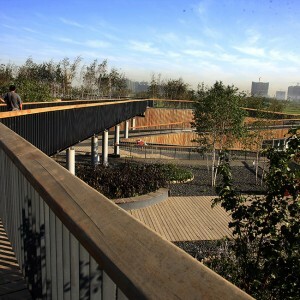 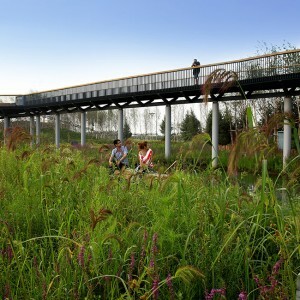 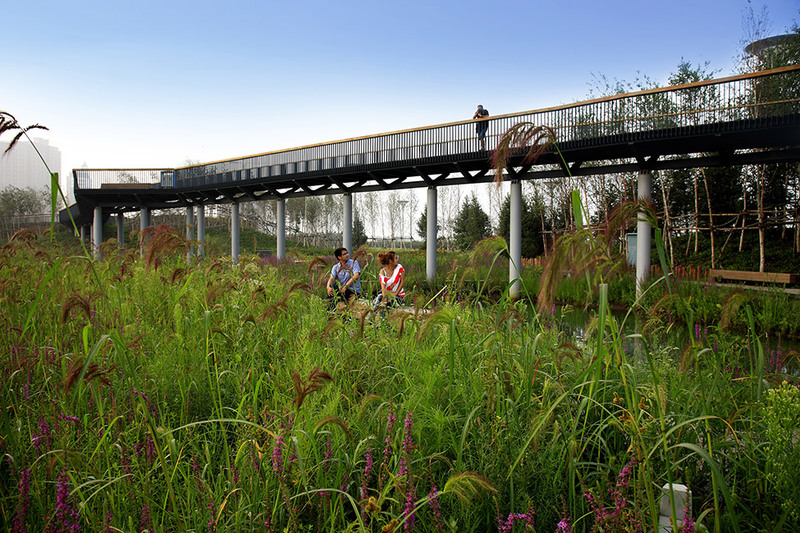 A skywalk links scattered mounds allowing surrounding residents to have an above-the-wetland and in-the-canopy experience. 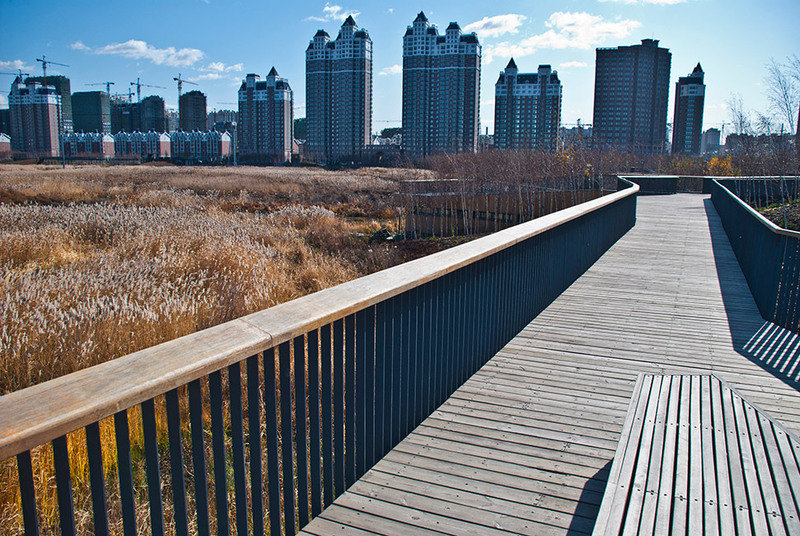 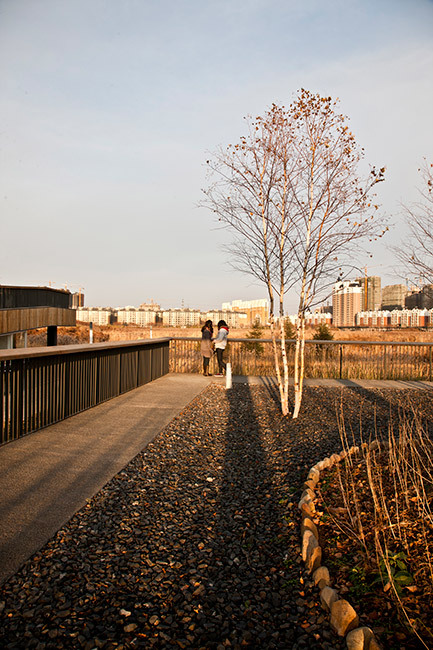 Through the transformation of this dying wetland, stormwater that frequently causes flood in the city become a positive environmental amenity for the city. 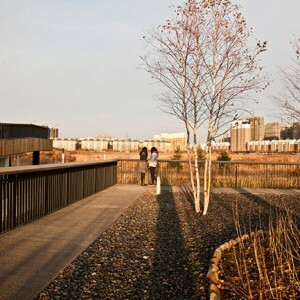 The stormwater park now has been listed as a national urban wetland park. 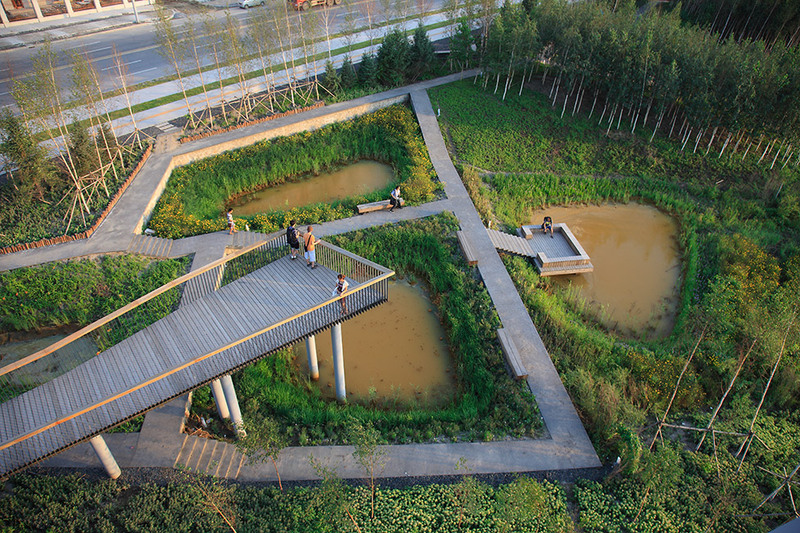 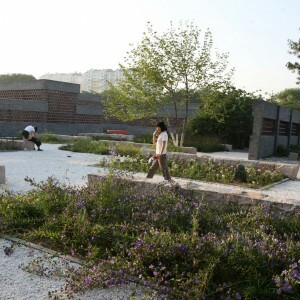 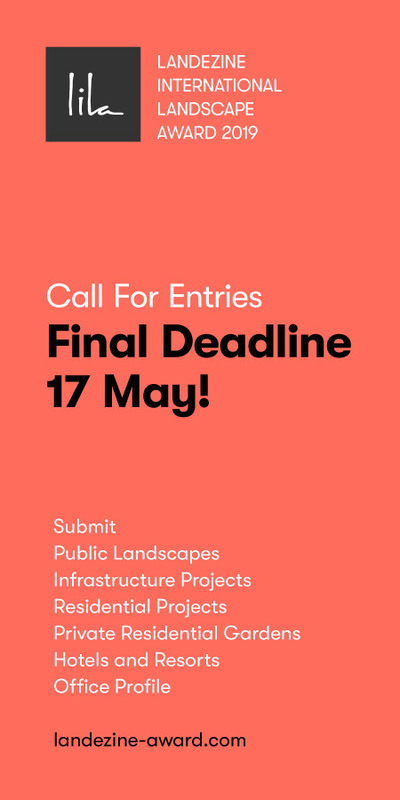 This project demonstrate an ecosystem services oriented approach to urban park design, and showcase an water urbanism approach.